Clickfunnels Review 2019 - What is Clickfunnels & is it worth my time? This clickfunnels review is going to help you work out if the platform could help your business. If you run an online business you will know that you can end up spending a lot of money on tools and software to help improve your operations. If you have experience in building an online business, the chances are you will have come across the above three at some point. If you are an Amazon seller, you might be thinking, “Ok, Amazon is great, but I don’t want to rely on it completely”, it’s always important to diversify in business, it limits the risk and protects your business interests. If you sell physical or digital products there’s a chance you rely heavily on email marketing to promote new items and re-market products/services to your customers. All in all you can end up needing a lot of different types of tools, to grow your business in the right way. Online Entrepreneurs will know about these problems all too well. I think the want to diversify your business is a good thing but it’s important to be able to do that without breaking the bank. What if I told you, there is a tool that allows you to manage the building, hosting and email responding elements of your business in a cost-effective way? You’d want to know more, right? What about if on top of that, i told you that the tool you help you make each customer more profitable? You see before i used clickfunnels, i hadn’t realised that a customer might want to buy more that i was offering, they just didn’t have the option! Let me introduce you to ClickFunnels, think of it as a website builder but on steroids. The best thing about clickfunnels is that it’s easy to use (once you know how). The tool has been built by internet millionaire sensation, Russell Brunson. 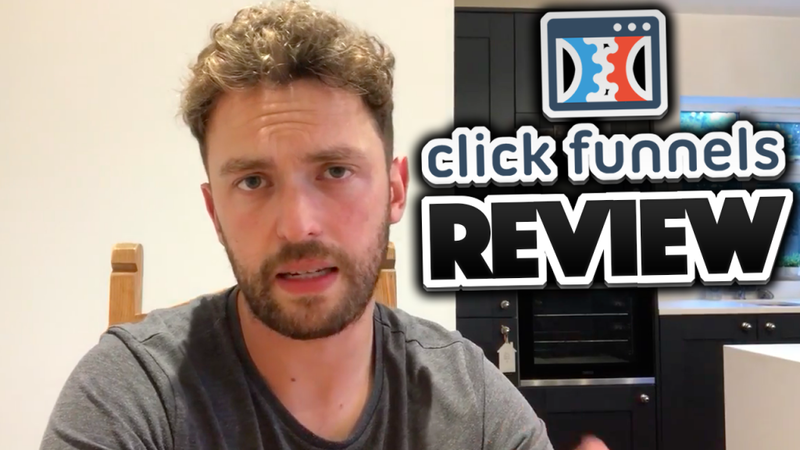 I wanted to write this clickfunnels review because i believe it can transform almost any business, it’s not just a piece of software, its a business model. Let’s talk about Russell, the guy that invented it. Russell was born in Provo Utah on 8th March, 1980. He started his first online business in college, it all started when he and a couple of friends decided they wanted to build a potato gun. He went to home depot to grab a whole load of stuff to then spend the week building potato guns. It turns out there were over 18,000 people searching every month, there and then he decided to start a business that would sell potato guns, he wanted to become a potato gun expert! Russell built Clickfunnels as a tool to help him sell the potato guns, he probably didn’t think that by creating the tool he would bypass $1,000,000 in sales for the year. This is all from an online business ran out of his basement. Because it was so successful, he decided to turn it into a tool that everyone could use, this way he could share the success whilst building another business and what a business it has become! So far Clickfunnels has created over 206 millionaires, users that pass the $1,000,000 mark in sales, are invited into his exclusive “2 Comma Club”. I think we can safely safe that clickfunnels has worked well for a fair few people. Russell has also written one of my favorite books of all time (Expert Secrets: The underground playbook) by clicking on the image below you can get the book for FREE. All you have to do is pay the shipping cost ($7.95 US/ $14.95 International). He has also written another of my favorite books – DotCom Secrets: The underground playbook, again you can click the image below and get the book for free, the same applies with shipping cost, it usually retails at $19.95, but you pay just $7.95 US/ $14.95 International. Dotcom Secrets contains one of my favorite quotes of all time, when you understand the quote, you understand how powerful Clickfunnels is. This is one of my favorite quotes from DotCom Secrets, it really stuck in my head. If you haven’t read the book, it goes onto explain that by offering more to your customers, each one will become more valuable. Creating a sales funnel allows you to provide each customer with the right offers for them, some customers want to spend more, but you simply aren’t giving them the option! Think about that, how much money are you leaving on the table? If you manage to make your customers more valuable, in turn you are able to spend more money acquiring them in the first place. When i read this, the penny dropped, i remember thinking, i get it now! My perspective changed from; trying to find as many new customers as possible to; focusing on making my existing customers more profitable , for me this was a real lightbulb moment! Once I finished the books, Russell had convinced me that I needed to start building funnels for my business. You can get your own free copy of either book by clicking the images above, all you have to pay is the shipping (Don’t say I don’t look after you!). There is a lot of debate on which book is best to start with, I’d say start with DotCom Secrets but make sure you read both! He provides you with expert guidance in a step by step format, you can see why he has such a big following, anyway let’s move onto the next question. 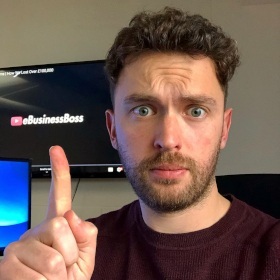 Now that you’ve got a bit of background on the man that created Clickfunnels, let me tell you a little bit more about the tool and then I’ll go on to show who it’s suitable for. To put it simply, Clickfunnels is an online sales funnel maker, it allows you to easily build and host mini website pages. These are known to most as landing pages. With your landing page you have many different options, your preference will depend on you and your business. Maybe your aim is to collect emails so that you can send relevant offers to your list, if this is the case you will be sending your customer to a lead capture page. Usually the visitor will input their email in return for something of value, this might be an ebook, cheat sheet or a heavily discounted product. From this point on you can automatically stage further pages as you see fit. Maybe the visitor has taken you up on your initial offer and now you’d like to send them to an “upsell” (this is where you are offering another of your products). If they purchase this you might send them to another upsell before directing them to the thank you page etc, etc. If they don’t purchase you might automatically send them to a down-sell page, the choice is yours but hopefully you are starting to understand the process. Clickfunnels provides you with ultimate flexibility, you can build as many webpages as you’d like, then they can be seamlessly linked together based on the actions your visitor takes. This might all sound a little complicated, if you are still a little unsure about clickfunnels and whether it can benefit your business, you might want to attend this free webinar. An important part of this clickfunnels review, is to establish who it might be suitable for. To be completely honest, clickfunnels can be used for almost any business, Russells methods can even work for offline businesses. Basically, if you have something to sell, Clickfunnels can probably help. If you want to learn a little more, I’ve got some free content for you. Check out this webinar involving Russell’s weird niche funnel, you might not believe it but it’s said to be making him in excess of $17,000 a day. Click Funnels has many different features, all of which can help businesses generate more leads and increase sales conversions, if they are used correctly. Think of a sales funnel as a small series of mini-websites that guide people through the product purchase process, you are literally walking your customer by the hand towards your checkout page. Next up, the integrated email responder. Now, I don’t know about you but in the past I’ve found integrating a website with any related tool can be a real pain, I don’t know why but it never goes to plan and I end up wanting to throw my laptop down the nearest set of stairs. I have pleasure in telling you, Clickfunnels has a fully integrated email autoresponder service, without further a do let me introduce you to “Actionetics”. You’ll be pleased to know this comes as standard with the Etison Suite Click Funnels membership. Actionetics – Why is it good? As mentioned, this is the email autoresponder “arm” of clickfunnels it’s clever and easy to use. Check out this explainer video. If you aren’t using an email autoresponder it’s likely you are leaving a lot of money on the table. Any business would pay good money to send targeted, behavior driven messages to their customers and using email is the easiest way of doing this. Email is only best if you are using it in the right way, Actionetics most certainly does this (well, I think so anyway). You can literally build an entire sales funnel in a few hours. In my opinion Clickfunnels has changed the game. I think that in the future a lot of businesses will move over from the traditional website to an online sales funnel, and when you understand how they work, you can see why! Set up an email autoresponder etc, etc. When something needs changing you have to go through the different tools and programs independently, which can take up a lot of time. It’s much easier to manage everything in one place, the drag and drop functionality makes it easy for anybody to make desired changes, Russell has even taught his children how to build funnels, you don’t need to have any tech experience. All you need is the desire to try something new, clickfunnels will teach you everything you need to know with their free training support. So, most importantly ClickFunnels is easy to use, you can edit all of your landing pages within the theme editor, you literally click and drag everything into place. If you want to go with something proven, you can use one of the many pre-made templates. ClickFunnels will only provide you with templates that have worked well, they literally split test everything! Russell shares 22 different types of funnels that have brought him success within his own business, these are available for you to copy, once you sign up. Creating your first funnel is simple. You choose your funnel type, pick a template, Tailor each page to suit your business, add products then set up your payment integrations. Once this is done you can set a domain name and save your funnel. Warning: Building profitable sales funnels can be highly addictive, you should do so at your own risk. Now don’t get me wrong, I really like get-response and lead pages, if you like these i’m sure you’ll LOVE clickfunnels. In my opinion its easier to use and if you want to scale your business Russell includes a lot of training you can opt in to. I’d recommend this, people pay Russell up to $1,000,000 for his expertise, the guy is a genius. A next major plus point for me is the intergration, if you want to continue to use your own email autoresponder, you can! It seamlessly intergrates with the likes of Mailchimp, Get response, Aweber and many more. What have you got to lose? If you want to give it a go don’t pay full price, make use of the free trial by using this link! I can always appreciate a program that allows you to try before you buy, if you try it out and don’t like it you haven’t lost a cent! I’d recommend signing up to free trial, even if you only test out clickfunnels as a tool, you can create a few funnels and test them out right away. Actionetics is a very cool part of clickfunnels, it’s intelligence is astounding, it captures detailed data of anyone that subscribes to your list and it’s all included within the clickfunnels membership. Here is a testimonial from Mr Garrett J. White, he went from a broke P.E teach to a powerful entrepreneur, he speaks highly of Russell and Clickfunnels as a platform. Ok, so I’m sure by now you get it, I like ClickFunnels! If you are like me, you might be thinking about giving the free trial a go, before you do let me recommend that you do a couple of things. Watch the free webinar! It will help you understand Click funnels and how it might be able to help your business, you might even watch it and think actually this isn’t for me! If you don’t investigate you will never know. Start thinking about something you could give to a potential customer for free, most sales funnels start with an “Optin Lead Capture Funnel”. This is usually “something” you can give to your customer in exchange for their email address, whether this is an ebook or a free product (maybe the customer just pays shipping). This is going to entice them into your sales funnel. Think of this as a bribe, the better the offer is, the better your chance of convincing to customer to buy another of your products, it’s your chance to introduce you and your company! Have a think about what this “something” could be before signing up for the free trial, that way you can make good use of every day you get. I’d also suggest ordering one of Russell’s books, if not both! If you’ve found this article useful please consider sharing on social media, you can find the buttons below. I use siteground for all of our websites! They are brilliant, the customer service support is the best i’ve experienced.